Demi Lovato has been open about her recovery from addiction. And because she has been open about her struggles, she has become quite an inspiration to many fans and people either dealing with or having gone through difficult times themselves. 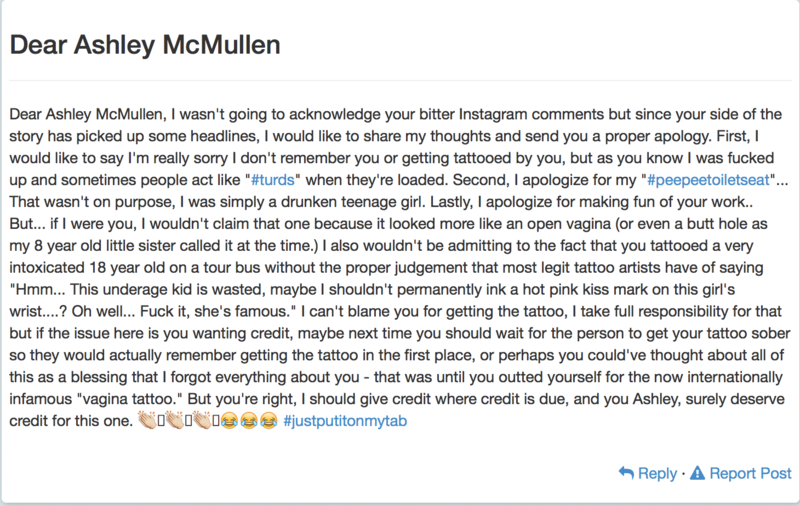 So, when tattoo artist Ashley McMullen lashed out at the singer, her response was not only spot-on but truthful, honest and contained just the right amount of snark to get her point across. So many things wrapped up in just a few short posts. Aside for the obvious grammatical errors, it’s totally classy to not only trash Lovato, but then take digs at another tattoo artist who has nothing to do with the beef between these two. But let’s just leave it up to the very levelheaded and well-spoken Lovato to point out the truck-size holes in McMullen’s rant. She closed it with the most appropriate emojis ever: the crying-laughing face.